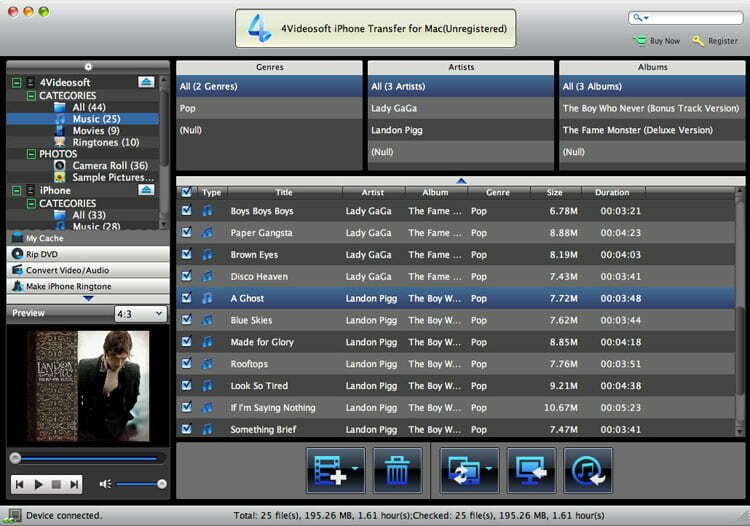 4Videosoft Mac iPhone Transfer Platinum is able to back up iPhone music, movie, e-books, ringtones, and photos and more on Mac. You are able to transfer local files to your iPhone. It can also help you backup iPhone SMS and Contacts to your Mac for safety. Now it highly supports iOS 7 and the latest iPhone 5S, iPhone 5C, iPhone 5, iPad Air, iPod touch, etc. This professional Mac iPhone Transfer is able to transfer files between Mac and iPhone. It enables you to transfer files between Mac and iPhone 5, iPhone 5S/5C, iPad air, iPod Touch and iPad mini 2 and so on. You can export your files to iTunes as you like. And you can also transfer files between two different devices. You are never worrying about losing your important information for you are allowed to backup your SMS and Contacts so as to avoid mistakenly deleting. 4Videosoft Mac iPhone Transfer Platinum is also a powerful iPhone video converter. You can convert video, audio and DVD to iPhone MP4/MOV/M4V so that you can enjoy them on your portable devices like iPhone, iPad, and iPod and so on. You are able to convert your movies to iTunes library with high speed and quality. In addition, the Mac iPhone Transfer Platinum provides you with versatile editing functions like effect, trim, watermark and crop to optimize your output videos. In addition, you are allowed to save your videos to My Cache for future use. You can make iPhone Ringtone for your iPhone with local songs or you can make them with DVD movies and general videos. It allows you to select the start time/end time and fade in/out for your iPhone Ringtone. The Mac iPhone Transfer Platinum can help you edit ID3 information of your iPhone such as edit name, artist, album, lyrics, etc. Aleesoft Free MKV Converter is a freeware can convert MKV video files to formats for portable device including iPad, iPod, iPod touch, iPod video nano, iPhone, Apple TV, Zune, XBOX 360, PSP, PS3, Nokia, BlackBerry, Sony moblie phone, etc. DivX Author is the first-full featured DivX authoring program, allowing you to create and enhance DivX videos with advanced features like interactive menus, chapters, multiple subtitles, and audio tracks. You have saved a Flash movie to your hard drive. What's next? How are you going to play it? You can play it with Internet Explorer, but if you don't want to bother yourself with"file association configuration"use SWF Opener -swf files player!